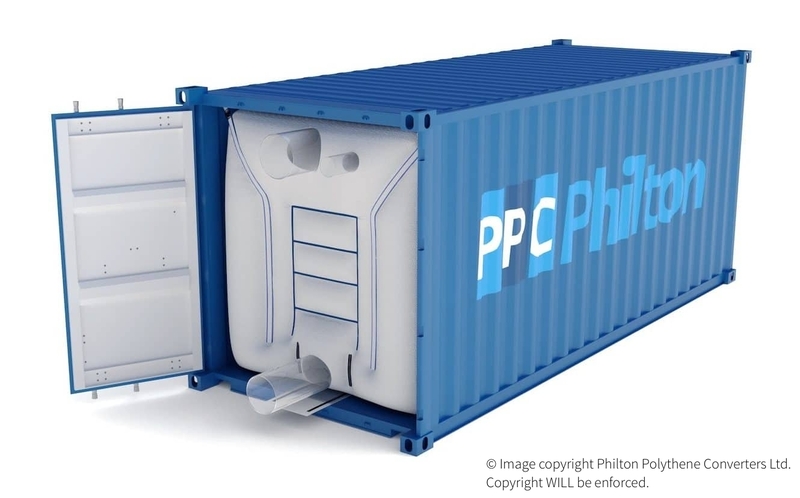 Converts any Shipping line Container for the bulk transportation of most free flowing non-hazardous products. Can be Installed inside any size shipping container. Loaded from the door end using a belt thrower, pneumatic pump, conveyor, or elevated to load under gravity depending on the loading system, or product being loaded. Capable of carrying a huge range of free flowing granular, powder, pellet or flaked products, both food grade and Industrial grade. Designed for loading or discharge with one, or both doors open. PPC Philton liners are manufactured in our ISO9001 / ISO22000 quality assured plants with strict raw material testing, QA procedures and controls. Food grade high tensile co-extruded LLDPE film offering excellent moisture (Water vapor transmission rate – WVTR) barrier properties. Woven HDPE or Woven PP fabrics offering high strength at a low cost. Antistatic / Dissipative Food grade high tensile co-extruded LLDPE film offering excellent moisture (WVTR) barrier properties as well as static control properties. Made from seamless PE films or wider width woven fabrics to reduce the number of joins. PPC Philton liners are best in class, extra durable with a superior safety record. 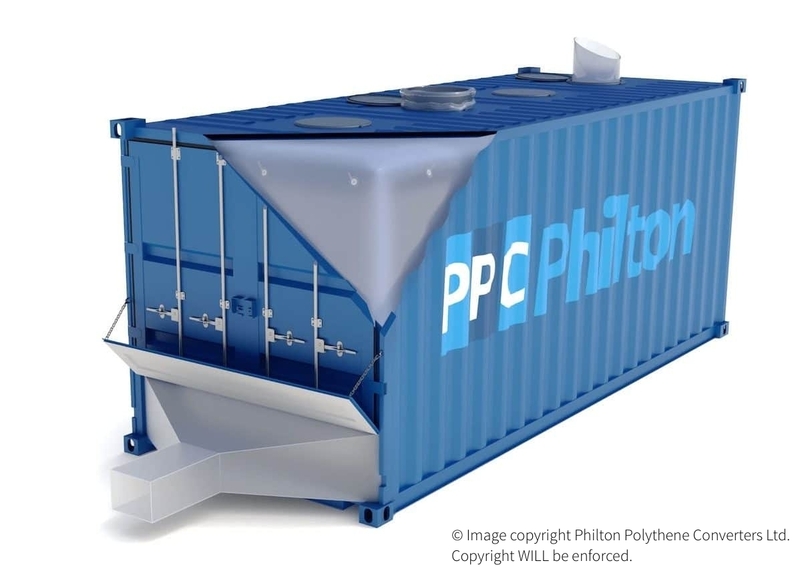 PPC Philton liners maximize the container payload, reduce costs, and minimize the environmental impact. All component parts are 100% recyclable. Any number of loading and venting spouts can be fitted to suit the customers’ requirements in any shape or size. Wide access Zippers for conveyor loading are also available. Discharge via gravity, or pump. Any number of discharge spouts can be fitted to suit the customers’ requirements in any shape or size. Airbags can be added to aid discharge. 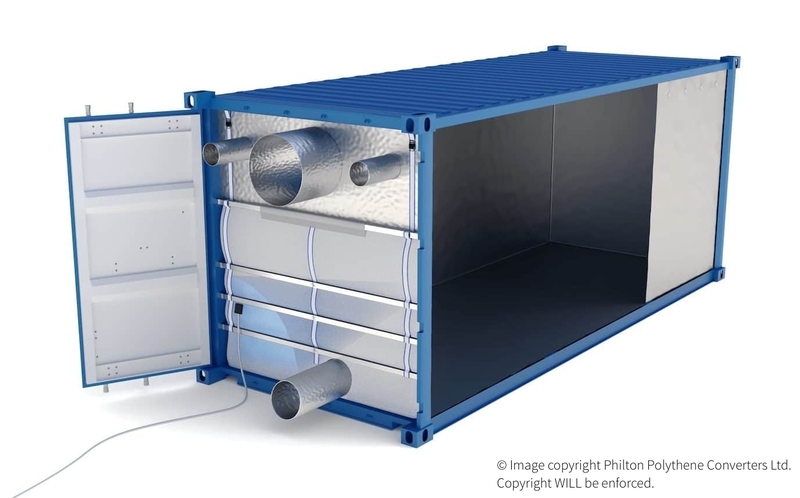 Enables a Bulker Container to be used for bulk transportation or storage of most free flowing non-hazardous products. Can be Installed inside any size bulk container. Loaded from the top hatches via gravity fill or via a single hatch with a spreader system. 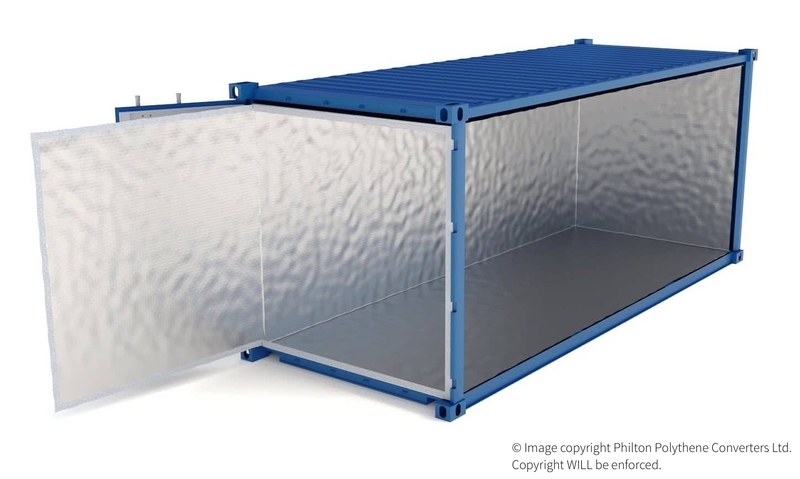 Designed for discharge via the letterbox hatch or hatches at the base of the container end. Any number of loading spouts can be fitted to suit the customers’ requirements. Fishtail discharge spout is standard, but other wide access spouts are available to suit the customers’ requirements. Allows any Container, Trailer or Railcar to safely transport many bulk non-hazardous cargoes. Can be Installed inside any size shipping container, trailer, or railcar. Open ended, open top, top loading or end filling via loading spouts. Capable of carrying a huge range of free flowing, palletized or packed products, both food grade and Industrial grade. Open ended, open top or manufactured with any number of loading and venting spouts to suit the customers’ requirements in any shape or size. Wide access Zippers for conveyor loading are also available. Discharge via gravity, or suction pump for free flowing products or Fork truck for palletized goods. 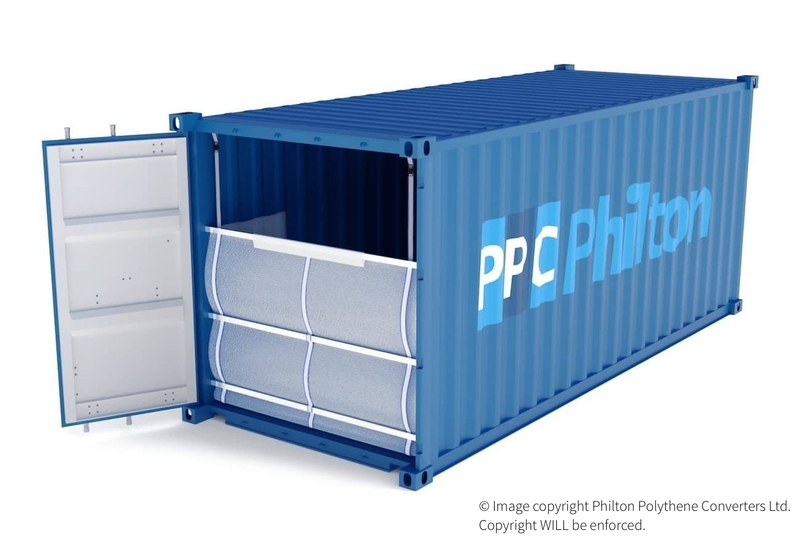 When installed inside a Container, the PPC Philton Foil Liner provides a controlled climate for the cargo. Can be Installed inside any size shipping or bulk container. Open ended, top loading or end filling via loading spouts. Excellent protection for products which may deteriorate due to odour, light, oxygen or moisture ingress. Discharge arrangements to suit the customers requirements. Aluminum barrier foil laminate co-extruded PE / PET /Aluminum Foil / co-extruded PE. Woven PP bulkhead for End filling liners. Superior protection for sensitive products compared to PE film or Woven liners. Up to 80 times more effective than 125mu PE film at preventing moisture damage. Foil liners can be completely sealed for airtight containment. Open ended, or any number of discharge spouts can be fitted to suit the customers’ requirements in any shape or size. Capable of carrying a huge range of free flowing granular, pellet or flaked Industrial grade products. Antistatic / Conductive fabric grades are available. Made from wider width woven fabrics with internal baffles to retain the load. 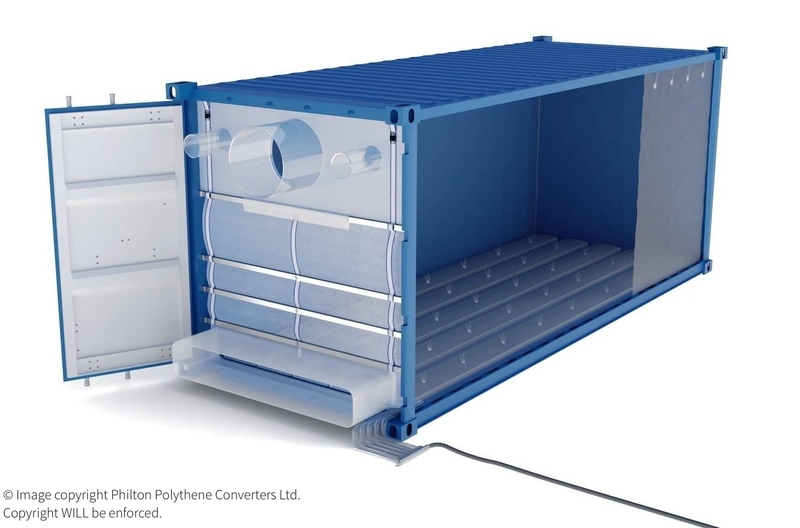 Enables ‘hard to flow’ non-hazardous products to be easily discharged from a Container. Full or partial fluidisation available. Can be controlled section by section, or either end of the container. Capable of carrying a huge range of hard to flow and compactable products such as fly ash, Calcium carbonate, flour and talc. Increases the range of products that can be transported. Virgin Food grade high tensile co-extruded LLDPE film offering excellent moisture (WVTR) properties. Made from seamless Heavy duty PE films to reduce the number of welded seams. Unique flat floor system avoids bridging points made by hoses, as seen on inferior designs. Quickly fluidises heavily compacted product to allow an easy flow and controlled discharge. Any number of loading and venting spouts can be fitted to suit the customers’ requirements in any shape or size. Discharge via gravity using air for the fluidising system. Generally used with larger discharge spouts. 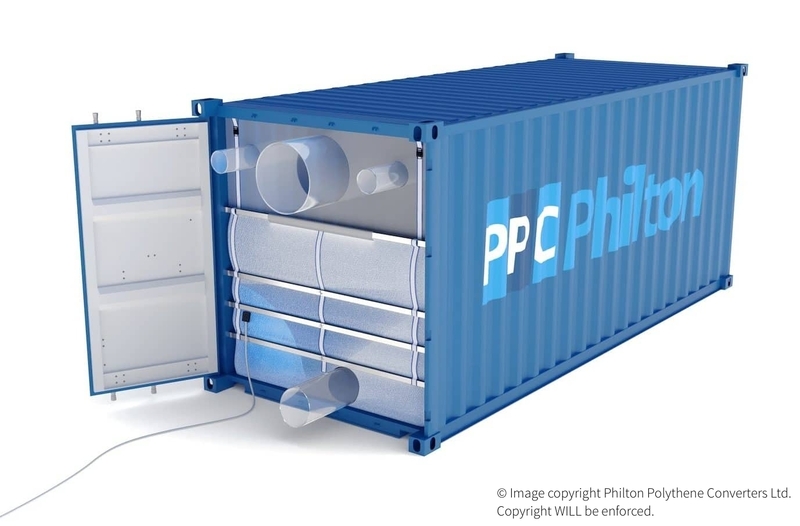 When installed inside a container, the PPC Philton Thermal liner reduces the peaks and troughs of climatic change. Open ended to allow palletized or loose packed goods to be stowed. Full width and height access for loading. Excellent protection for products which may deteriorate due to radiant heat. Woven Aluminum barrier foil laminate co-extruded PE / PET /Aluminum Foil / co-extruded PE. Reflects over 90% of radiant heat to stop temperature peaks and troughs from damaging sensitive cargo. Zipper or Velcro closure system. Converts any Shipping Line Container for the bulk transportation of most low cost non-hazardous bulk products. Capable of carrying a huge range of free flowing granular, powder, pellet or flaked products, both food and Industrial grade. 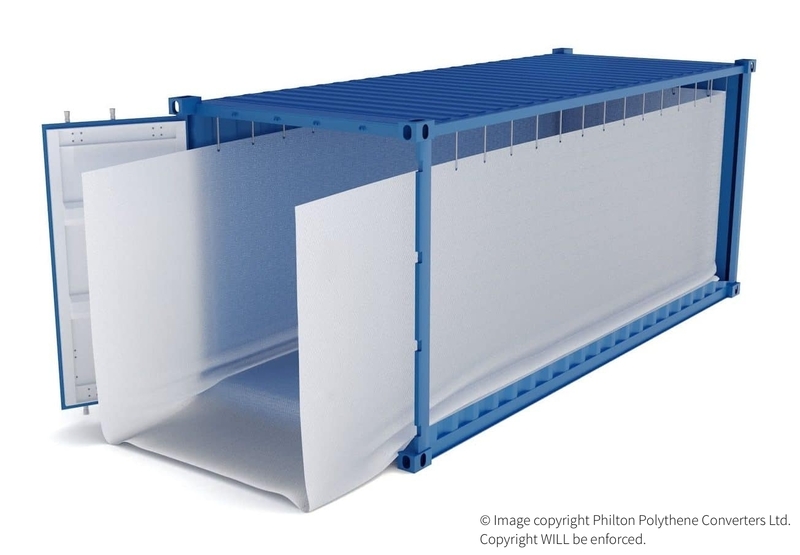 PPC Philton bulkhead sheets are manufactured in our ISO9001 / ISO22000 quality assured plants with strict raw material testing, QA procedures and controls. Very low-cost system for loading products not requiring total containment. Discharge via the ‘rip and tip’ method, or via a discharge spout. "Formag Logistic" LLC / ООО "Формаг Логистика"